One of the best ways to build up a fan base for your band is to play live as often as you can. But sometimes, bands find themselves between a rock and hard place: To get a gig, you need an audience, but to get an audience, you need a gig. You can rise above the paradox, however, and get your band in front of the crowd with careful planning. Landing a single show is an important start on which you can build to book your band an entire tour. 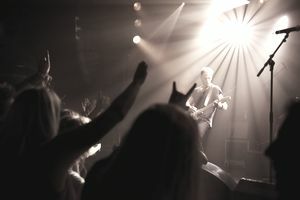 To book a gig and possibly a tour, you'll need to know how to promote your band and how to do business with the venue. The best place to start looking for gigs is in your own backyard. Get to know the music scene in your area. Which venues and promoters are willing to give up-and-coming bands a chance? Which bands in your area play live often and might need a support act? What venues in your area put on touring bands who might need a local opening act? To get a gig, all of these factors and more can come into play. Approaching the right venues will open doors for you, and there is strength in numbers, so working with the other bands in the area can increase opportunities for everyone. Plus, you can share gear. Have a standard package ready to help introduce yourself to venues and promoters. Much like the package you use when you send a demo to a label, this promo package should be short and sweet. Include a short demo CD, a short bio or one sheet to introduce the band, and some press clippings if you have any, especially if they review live performances. If you're going to approach people by email instead, cut and paste the info into the body of an email and include a link to a site where your music can be heard. Don't send attachments, as most people won't open them. To get a gig directly with a venue, call to find out who is in charge of booking bands and send them your promo package. The venue may tell you when to contact that person again. If not, give them about a week, and follow up by phone or email. Keep trying until you get an answer. If you've haven't played live much, your best bet is to try to get on an existing bill with a band that already has a following. Keep in mind that if you book with a venue, you may be in charge of promoting the show yourself and paying venue rental fees, unless you are invited to join an existing concert bill. If you'd rather not self-promote and take on venue fees, you can approach a promoter to get a gig. Send your promo pack to the promoter and follow up like you would with a venue. If a promoter agrees to get you a show, they will book the venue and promote the show for you, but you may need to send them posters you have made yourself to do so. If the promoter doesn't want to put you on by yourself yet, ask them if they have any shows you could play as an opening act. If they say no, check in from time to time to remind them you are available as a support act. This is the trickiest part for most bands. When you are just getting started, you often will not make money on your shows. In fact, you may even end up paying something out of pocket. That doesn't mean it was all for nothing—building up your fan base will mean that you do make money on future gigs. If you do make money, you will either have a deal where you get paid a pre-agreed amount no matter how many people turn up, or you will have a door split deal. Either deal can be fine and fair. Focus on building your audience and not the money in the band's early stages. It sounds obvious, but the way you handle the gig can have a lasting impact on your ability to get future shows. Show up on time for the soundcheck, and if other bands are playing, remember that everyone needs time for their soundcheck. Be professional—there are likely to be free drinks around, but remember everyone is there to hear your music, not to see if you can handle your beer. Don't sell yourself short by getting on stage in anything but your top shape, ready to play a great show. Play a good show, be courteous and professional, and you'll have a better chance of getting more show offers. Your goal is build up your audience. Promoters and venues take a chance on you when you are just getting started, and they will be more willing to give you a chance if you don't have a lot of financial demands. If you're putting on your own show, of course, you may have to pay a venue hire fee and you may pay some promotional costs. However, don't pay money simply to get on a bill, and don't trust anyone who asks you to do so. Keep entertainment writers at your local papers and websites informed about your activities and always invite them to the show. Also, keep your local radio stations and music podcasts up to date on what's happening with your band and when you're playing. Guest lists have a way of getting out of hand, fast. Don't push it with promoters with the guest list when you are trying to build up a name for yourself. If you're part of a larger bill, you may not even have any space on the guest list. If you do, use what you have and be done with it. Don't try to get 50 of your closest cheapskate friends into every show for free.